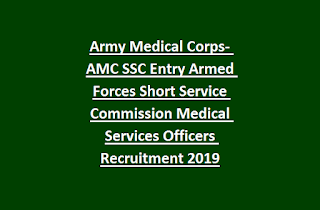 world finest service of Armed Forces(Army, Navy and Armed Force), they can apply online for the post of SSC Officer through Army Medical Corps SSC Entry at http://www.amcsscentry.gov.in/. The application form for AMC Entry SSC Officer is available online from 27/04/2019 to 26/05/2019. It is the best option for medical graduate to get trained in Armed Forces SSC Officer. Don’t let it go grab this opportunity and improve your skills. Selection for these vacancies will be through Personal Interview only. Candidates must have completed their internship program on or before 31-12-2018. Vacancy details are not at disclosed. For Armed Forces Medical Services educational qualification details online application procedures, important details are given below. Army Medical Corps is the best medical services in Country. AMC provides medical services at the time war, during natural issues at national and international level. And it provides the health care for all services professionals. Tentative Interview Dates from June/July 2019. Medical Services Officer vacancy details are not at provided. 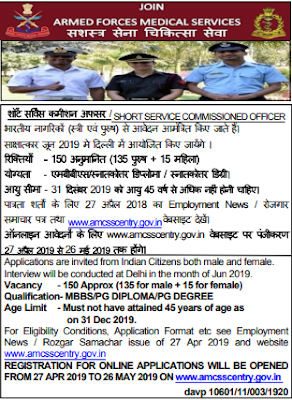 But as per sources there are plenty of vacancies available for Officer Jobs to serve as AMC. The candidates upper age limit is 45 years. Age limits are applicable as on 31-12-2019. DEPARTMENTAL PERMANENT COMMISSION (DPC): SSC Officers are eligible to apply for grant of DPC their age limits based on qualification is given below. The candidate must have passed MBBS Examination and should have completed Internship on or before 31-12-2019. Applicants who have taken more than two chances two qualify MBBS Examination they suggested to not apply for these vacancies. The candidates who serving as doctors will be granted the rank of Captain with the pay scale of Rs.17160-39100 + Grade Pay Rs 6100/- + Military Service Pay Rs.6000/- +Non Practicing allowances+ DA and other allowances. Total emolument at the time joining in service will be Rs.78000/- of Accommodation facilities will also be provided. For promotions information refer the official notification. The candidates are required to pay online Rs. 200/-for application form. SSC Officer of Medical Services will be selected based on marks obtained in interview. NCC Certificate having candidates will get the high weightage. Based on this marks a merit list will be prepared. Based on merit list candidates have to undergo for medical test. 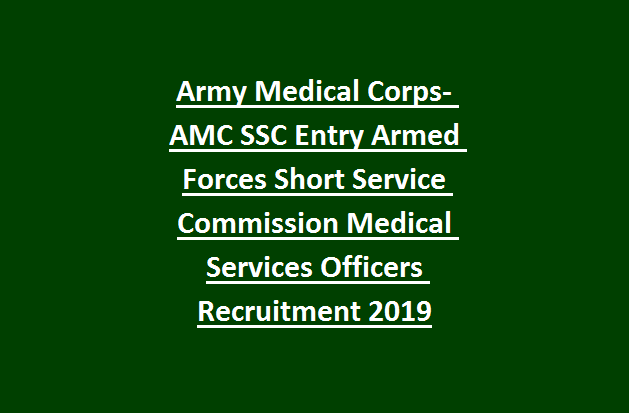 Then final list will be prepared and based on available vacancies candidates will be appointed as SSC officer of Medical Services of Armed Forces. Selected candidate be posted to work any one of the defense of Army, Navy, Air Force in India or Abroad. Interview will be conducted on Kolkata only. Eligible candidates can submit their application online through the official web site of Indian Army www.indianarmy.nic.in Before applying online please read the official notification.